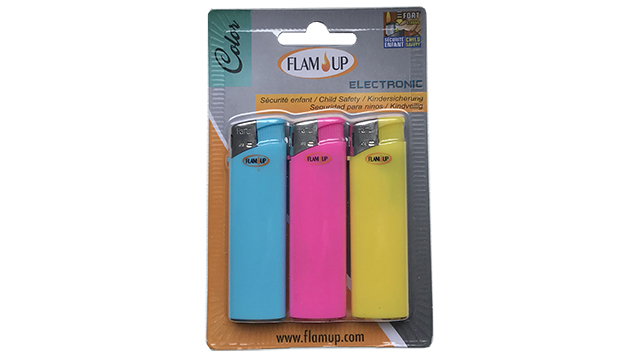 Blister with 3 lighters - 5 different colors, CHILD SAFETY. 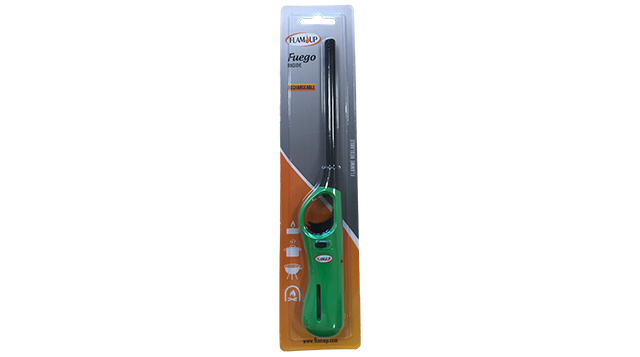 Product delivered in display of 20 blisters or cardboard of 6 displays. 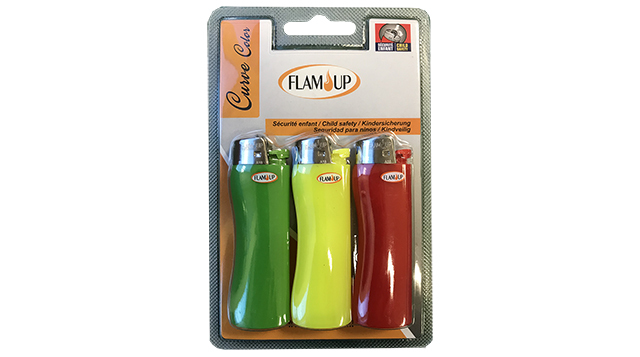 Blister with 3 curved lighters, fixed flame - 5 different colors, CHILD SAFETY. Product delivered in display of 20 blisters or cardboard of 6 displays. 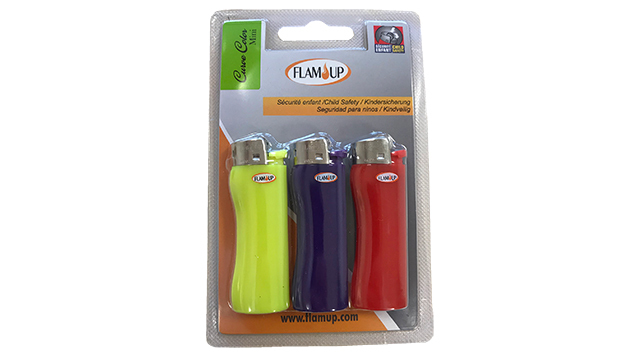 Blister with 3 mini curved lighters, fixed flame - 5 different colors, CHILD SAFETY. Product delivered in display of 20 blisters or cardboard of 6 displays. 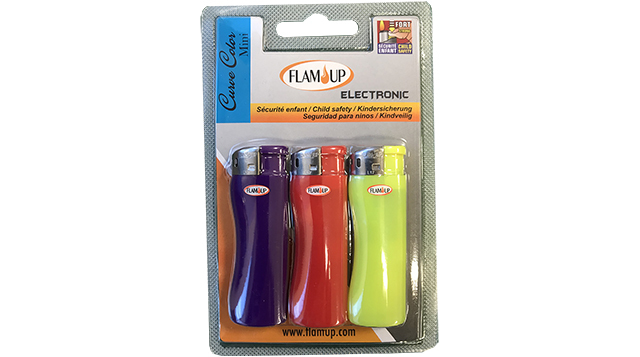 Blister with 3 curved lighters with transparent tank: gas of different colors, CHILD SAFETY. Product delivered in display of 20 blisters or cardboard of 6 displays. 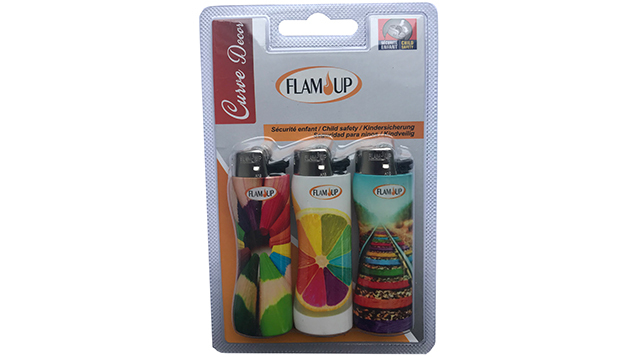 Blister with 3 mini curved lighters - fixed flame. Product delivered in display of 20 blisters or cardboard of 6 displays. 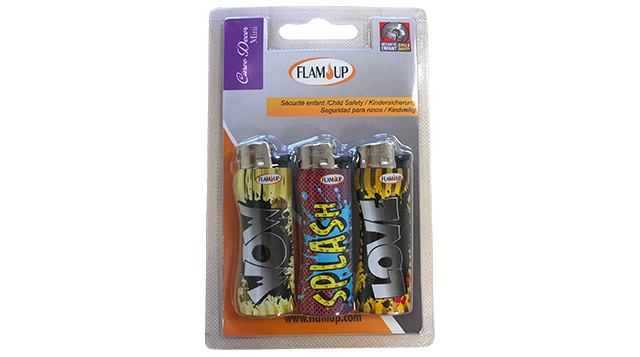 Blister with 3 curved lighters - fixed flame. Product delivered in display of 20 blisters or cardboard of 6 displays. Blister of 3 electronic lighters. Controllable flame. 4 different colors. CHILD SAFETY. Product delivered in display of 20 CSU or cardboard 6 x 20 CSU. Blister of 3 mini curved electronic lighters. 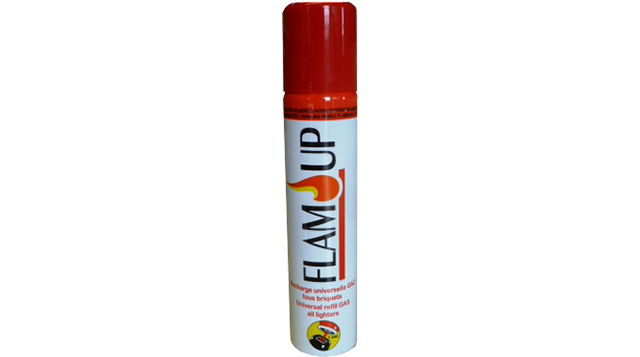 Fixed flame. . 5 different colours. CHILD SAFETY. Product delivered in display of 20 CSU or cardboard 6 x 20 CSU. Blister of an utility lighter. Rigid tube. Refillable. Controllable flame. 5 different colors. CHILD SAFETY. Product delivered in cardboard with 20 blisters. Universal gas refill (5 refill tips). For all lighters. Capacity: 90 ml. Product delivered in display of 24 CSU or cardboard of 10 displays of 24 CSU.